China's economy enjoys good start and may sustain momentum: China's real GDP growth has seen a strong start to the year at 6.4%YoY in 1Q, beating market expectations (6.3%). The gains have been across the board with household income growing faster than GDP that has seen real disposable income rising 6.8%YoY in 1Q and arresting the earlier decline in domestic demand. US likely to see slower GDP growth of 2.5% in 2019 but this is still well in positive territory: US data also appears to be stabilizing after a weak start in 1Q19. The latest payrolls data for March shows the underlying strength of the US labor market with the economy having added 196K jobs, bouncing back from just 33K in February while the unemployment rate remained at a record low 3.8%. Wages growth advanced a subdued 0.145% MoM, taking the year-on-year reading to 3.2%, below the median for 3.4% and dampening concerns about wage inflation. Europe still the laggard but German investors may be turning optimistic for the first time this year: The latest German ZEW survey's headline 'Current Situation' index for April came in lower than expected at 5.5 vs 8.5 consensus (11.1 previous) but the more important forward-looking "Expectations" print, which the market monitors more closely, was better than expected at 3.1 vs 0.5 consensus (-3.6 previous) for Germany and 4.5 for Eurozone (-2.5 previous), indicating that the financial participants in the survey may be turning optimistic for the first time this year. 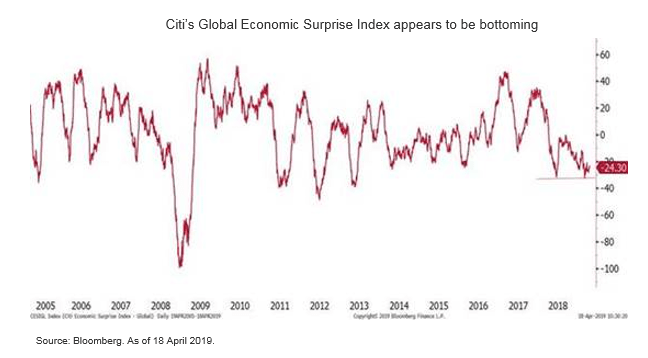 While volatility has risen compared to earlier in the present expansion cycle, Citi's base case view anticipates mid-to-high single digit gains for broad equities over the coming year and perhaps beyond. Money growth rebounded strongly - M2 growth jumped by 0.6pp to 8.6%YoY in March, much higher than market expectations (Citi/Mkt: 8.2%YoY). The corporate demand for credit seemed to have improved and thereby facilitated the process of money expansion.